A fundamental shift in science policy has taken place over the last decades, focused on competitive funding aimed to enhance productivity and efficiency. This has gone hand-in-hand with new models for organizing the public sector and with the spread of the notion that markets, competition and discipline drive societal innovation and progress. What has this drive for efficiency through competition meant for science, universities, and individual researchers? This article argues that the competition for resources, which is increasingly hard-wired into the contemporary university, aside from the high human toll it inflicts, is unlikely to achieve its aim of enhancing scientific productivity. In order to strike up a conversation, this contribution discusses structural changes to the funding of university-based research, arguing that shrinking resources played a lesser role than changes in the logic of how to distribute resources. 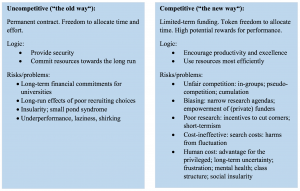 It compares and evaluates the rationale and problems of two different ideal-typical models for funding research, arguing that the competitive funding approach is less effective (and less humane) than the alternative, uncompetitive approach. Following the privatization drive and rollback of the welfare state in the 1980s, a revolution which became known as “New Public Management” (NPM) swept through the public sector. Widely-discussed publications such as “Reinventing Government: How the Entrepreneurial Spirit is Transforming the Public Sector” underpinned the spread of market logics and a focus on competition in public services in the 1990s and 2000s. NPM’s disciples argued they would make public services more cost-effective and mission-driven. The new approach parsed into higher education systems (in part) as a greater emphasis on competition in allocating research funds and jobs. Instead of holding life-time positions and fixed research budgets, as in a marketplace, scientists should contend against each other continuously for resources. The change of ethos coincided with a moderate tightening of public budgets, and universities in many countries faced the challenge of accommodating the expansion of higher education without public funding rising in step. Enrolment rose almost everywhere, with for instance 94 percent of secondary school leavers in the United States entering tertiary education in 2012, compared to 68 percent in 2000; or in Switzerland 56 percent (2012) versus 38 percent (2000). But as Figure 1 shows, government spending per student in tertiary education (relative to GDP) in many key countries stagnated or fell. Everywhere, universities faced questions about how to raise more resources and distribute existing ones. In some countries, private spending at least partly compensated the loss, as reflected in the growing problem of student debt, which for instance in the USA recently lay at US$ 1.2 trillion, or 6% of overall national debt. 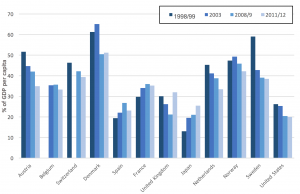 In terms of funding for research, some slight indications of creeping public defunding may be noted: total research and development (R&D) funds from 1.85 percent of GDP in Europe (2008) to 2.01 percent (2013), but the government’s share in this fell from 33.8 to 32.8 percent. In the USA no significant changes occurred. The figures do not indicate a massive public defunding of universities, but rather a gradual squeeze which coincided with NPM. The fundamental change thus was qualitative rather than quantitative – not less money spent, but rather, money is increasingly allocated in a different way, with resources made accessible more and more through competitive channels. For instance, at £63 billion, the European Union’s Horizon 2020 program is a mainstay of European research funding. Rather than spread funding widely, this highly competitive grant scheme disburses roughly 300 large grants per year, mostly to teams of already well-placed senior researchers concentrated in a few countries. At a national level, the German government launched its higher education “Excellence Initiative” in 2005 to grant special funds for five years to selected universities (€2.7 billion over the 2012-17 period) based on their qualifying as “elite” universities or launching “future-oriented” programs. Universities may use the funds freely, but given the short time frame, cannot build up sustainable structures and instead, for instance, buy equipment or hire temporary staff. Universities’ coping mechanisms for the stagnation or decline of funds, which are increasingly competitively allocated, have included tapping additional revenues from students, seeking out donations and private funders, and forming associations to advance special interests (such as the UK’s Russell Group). University administrators have, naturally, pushed their faculty to compete for external grants, and also organize internal funding competitions. No doubt, these policies have also encouraged cooperative behavior, but primarily in the form of tactical collaboration to survive and thrive in the struggle for resources. Model 1 (“the old way”): Researchers (junior and senior) are hired on permanent, fixed contracts. Within certain bounds (minimum performance criteria), they are “free” to allocate time and effort to various projects; they are constrained by the limits of their funding. 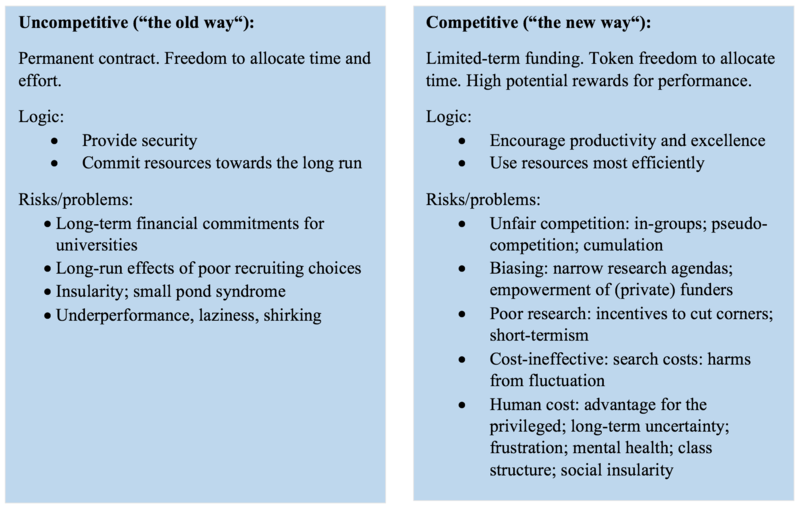 Model 2 (“the new way”): Researchers have short-term contracts or they self-fund through grants, which may be smaller or larger (sky is the limit). They regularly compete for jobs or assignments, and if they fail to produce the “best” research in the time available, they risk being outcompeted in the market for funds. Obviously, neither of these has ever existed in pure form. But in many ways the balance has shifted – in terms of economics, governance, and values – from model 1 towards model 2, with the result that more research is performed on a time-bound, economically competitive basis. Today, some research jobs are still permanent (the shrinking class of tenured Professors) while others are time-bound to varying extents. 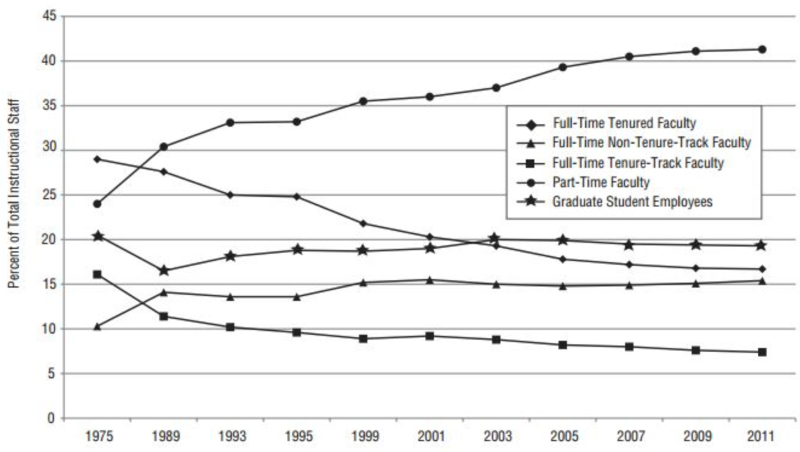 A report by the American Association of University Professors shows the share of tenure and tenure-track professors fell from roughly 45 percent in 1975 to less than a quarter in 2011, while non-tenured faculty, part-time faculty, and grad students took their place (see Figure 2). In Germany, a full 83 percent of academic positions in 2009 were temporary. The notable exception is France, 65 percent of whose (notoriously free-thinking) academics are tenured professors or maîtres de conference. It is worth assessing the respective risks and problems of both models, which may be seen as the flipsides of the advantages they promise. 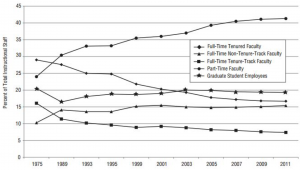 Figure 2: Trends in Instructional Staff Employment Status, US universities, 1975-2011. Model 1, “the old way”, offers researchers an opportunity to plan and act with a long-run view, both in their academic and personal lives. But it risks constraining researchers with fixed budgets and burdening universities with financial commitments over the long term. Poor hiring choices can have lasting consequences, as mediocre researchers or “free-riding” academics stay on. Scientists may feel pampered and underperform. Furthermore, researchers who never have to leave one institution may become insular and too comfortable as “big fish” in small ponds. Competition is often unfair. Being a member of closed networks or in-groups often helps secure scarce grant funding. The peer review process is rarely truly (double-) blind, and knowing the chair of the committee (or having appeased them professionally) can make a difference. Many calls for proposals are deliberately targeted to very narrow communities, and competitive only on paper. Furthermore, the benefits are cumulative, in that having secured funding once, or belonging to a successful team, makes it easier to secure funding again. Linked to these issues is a potential biasing of research, wherein funders and reviewers are empowered at the expense of researchers. The competition for funds encourages disciplinary narrowing and closure, since grant committee members are more likely to approve projects that advance their own field or “speak the right language”. And the greater the competition for public funds, the more attractive private funders (corporations, foundations) become. Their power to influence research grows, and research which they deem too critical or “unproductive” is undone; for-profit science (say, on palliatives for first-world medical disorders) may eclipse science holding greater social value (vaccines for tropical diseases). Beyond such biases, competition may lead to poor research. Cases of outright fraud, fortunately, remain rare; but the publish-or-perish environment leaves little room for learning from errors or backtracking, and rather encourages cutting corners. Recent investigations found only 39 percent of studies in psychology to be replicable, and only one-quarter or fewer of high-profile papers in biomedical research. There is also the tedium of results being published at the scale of “minimum publishable units” (SPUs), that is: smaller, less-useful papers which report only part of the results, but enhance researchers’ CVs. More fundamentally, the competitive funding system risks discouraging or even preventing long-term, complex and uncertain projects which may later prove groundbreaking. Grant programs (which usually want results promised in advance) might support step-by-step research well, but not science as exploration into the unknown. Operationally, the competitive approach may prove cost-ineffective for universities. The constant search for new candidates, particularly at postdoc and lower professorial levels, bloats administration and HR departments (where dissuaded academics, incidentally, are often happy to escape to). It keeps faculty from teaching and researching: among Swiss and German universities, for example, new faculty members are selected by a 10 to 15-person committee in a process that can take up to a year, whether the position is a tenured professorship or just a 5-year assistant professorship. Also, the constant fluctuation means new members must be brought up to speed, and departments regularly need to plug gaps, particularly in teaching, at the expense of quality. Finally, the competitive principle comes at a high human cost, which recent discontent – such as the February 2015 US adjunct faculty walk-out – reflects. The academic labor market has become a market not just of aptitude but also capacity to endure uncertainty and deprivation. This tends to benefit researchers from better-off backgrounds. The inability to plan careers and make life choices disproportionately harms women, but also hurts men. Moreover, constantly currying prospective funders’ and employers’ favor (in spite of rejection) is demeaning and stressful. A two-year postdoc works twice as hard, so as to spend their second year on job applications and grant proposals; while the funder or employer doesn’t notice a drop in productivity, the uncertainty and overwork take a psychological toll. UK polls find widespread psychological distress among academics, with anxiety (83%), depression (75%) and panic attacks (42%) being the most commonly-reported conditions. There may also be a harmful sociological effect, as the class gap between untenured dependent scientists and the shrinking professoriate widens. And the ivory tower grows higher as publications in ranked journals trump communication of results beyond one’s narrow field, and researchers engage less with “commoners” outside their usual work environment – which in turn makes science appear even more and distant and may lend credence to calls for defunding. The risks of model 1, “the old way”, no doubt, are real. Primarily these are mediocrity and inefficiency. Long-term hiring and funding choices can go wrong; lifetime positions may be held by mediocre scientists. A brilliant PhD does not necessarily make a good professor. Some researchers may even become mediocre by choice: anecdotally, at least, many academics will have stories about some free-riding colleague – although most academics rather may be described as (voluntary) workaholics, or even willing servants of an exploitative work environment – but few would truthfully argue that tenure makes professors lazy. The primary risk of model 2, “the new way”, is to undermine excellent science through the drive for excellence and efficiency. Many scientists have mitigated the harm by working to counter the effects of unfair competition, keep research agendas broad and unbiased, uphold quality standards, and keep departments running well. Many scientists, no doubt, can bear the stresses and still perform great science; but many others can’t, and not for lack of academic brilliance. With these issues outlined, an open question remains whether the intended gains in productivity – that is, quality of scientific output per dollar – materialize, or don’t. I suggest that the competitive university’s drive for efficiency is inefficient. The competitive allocation of resources not only harms scientists but is also managerially flawed. Instead of doing better quality research and teaching, academics dedicate more time and effort to the hustle for funding and jobs – writing grant proposals, sending job applications, sitting on hiring committees, reading proposals, tweaking poor-quality data, publishing – and reading – MPU papers, teaching departed colleagues’ courses, and dealing with mental health problems. The risks and problems of the second model likely outweigh those inherent in the first (see Figure 2). This discussion of course shouldn’t suggest research is never a competitive activity. In some ways it inherently is: researchers strive for recognition in their respective fields, based on the strength of their results, soundness of arguments, and innovativeness. In the broadest sense, following Niklas Luhmann (a German sociologist and a thinker in systems theory) actors in the “science system” compete and communicate using the code of “truth”. The error – from a political, ethical and managerial perspective – has been to elevate competition for economic resources tthe guiding principle of the field; or (with Luhmann) subordinating the science system’s code of “true/untrue” to the economic system’s code of “payment/non-payment”. The risk is that the science system may become dysfunctional. It appears the competitive university is less a product of budget constraints (though that too) than of an ethos which has percolated into the management of science. The shortening of job contracts, proliferation of performance-based positions, expansion of grant schemes, and so on, are emblematic of the neoliberal age. Challenging the competitive ethos in science entails questioning broader societal dogmas, since the drive to discipline scientists into self-optimizing and constantly maximizing output merely reflects generalized suspicions that security only pampers people and discourages their creativity and self-expression. But more competition may, paradoxically, encourage less innovation, risk-taking and progress, as for instance Mariana Mazzucato’s thesis about the “entrepreneurial state” being the key driver of technological progress under late capitalism suggests. Reclaiming the university as a space where economic efficiency is not paramount – at the very least because the desired efficiency doesn’t materialize; or better, because researchers are humans whose resilience should not be tested (or exploited) to the limit – is key to reconsidering it as a public good. Given the vast technological and social changes since the 1970s – globalization, digitalization, the Internet, massive open online courses (MOOCs), creative commons, and open knowledge, to name a few – how much more effective and useful for society, or more humane, or ideally both, could a better science system be?